The Harman Advance freestanding pellet stove has a glass hopper lid so it's possible to glance in and check out the fuel situation. Producing 48,000 btu. and rated to heat 1,500 square feet, this stove has a rear firewall accordion heat exchanger as well as the normal top exchanger. This unit has a large bay window, affording good fire views. The brick effect fireback is a standard fitting on this stove. The ash pan won't need emptying until a ton of pellets have been burned. Access is easy. The Harman Advance is a slim stove, only twenty and a half inches deep. Window Size 20 in. by 10 in. Rear Vent Height 7.75 in. 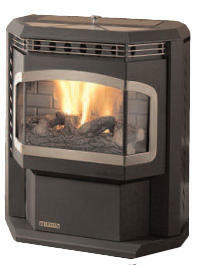 If you would like to leave a review of the Harman Advance pellet stove, please use the form on the contact page.